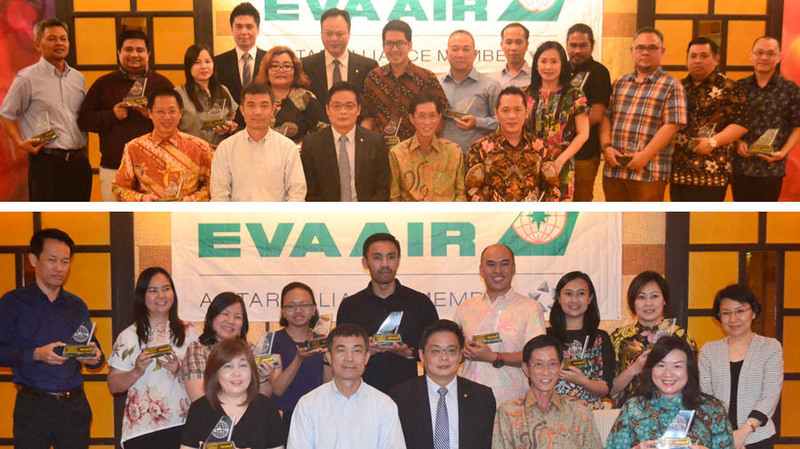 As an appreciation form towards the Travel Agents and Cargo Agents who have given their supports during 2017, EVA Air, as a global airline from Taiwan and operate in Indonesia, conducted an annual appreciation night for the Top Travel and Cargo Agents of 2017 on Wednesday (July 18, 2018) at Pluit, Jakarta. Attending the event were General Manager of EVA Air Indonesia Makmun Hamsa with the managers and staffs from passengers and cargo divisions, also important guests from EVA Air headquarter, they are Solon Wu - Junior Vice-President of Cargo Management Department, Angus Chi - Manager Business Management of Sec. I Cargo Management Department, James Lin - Deputy Manager Business Management Sec. I Cargo Management Department, and other guests of honour.